ASUS has quietly added a new premium Zen AiO desktop to its lineup of all-in-one PCs. The latest high-end Zen AiO significantly improves in performance over the predecessor in almost all aspects, including the display, processor, discrete GPU, memory, storage subsystem, and so on. Furthermore, the new Zen AiO features a radically new design that enables its advanced capabilities. ASUS launched its first AIO PCs with 22 and 24-inch displays and an iMac-like design in mid-2015, targeting casual users looking for style and “good enough” performance. 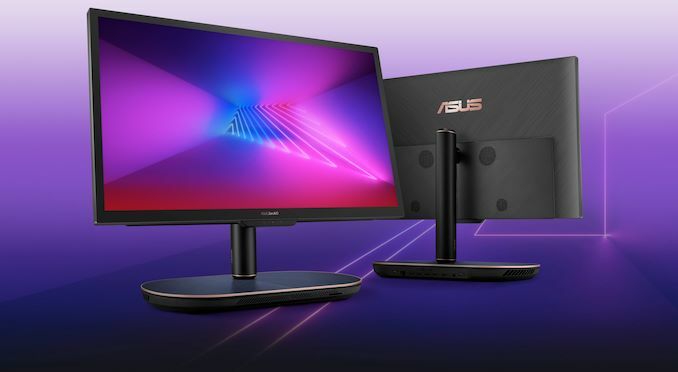 Since then, ASUS has been expanding its lineup of all-in-one desktops with higher-performance Zen AiO systems, more affordable Vivo AiO PCs, AiO Pro machines aimed at demanding users, and so on. All of these products used a similar iMac-like design with all of its pros and cons. With the latest Zen AiO 27 Z272-series the manufacturer switches to a brand-new design concept that places compute hardware into the PC’s base (we have already seen something similar from HP), which allows to use higher-performance components and enables ASUS to make an adjustable stand, a rare feature on AIO PCs. Meanwhile, the new system comes in ASUS’s signature Deep Dive Blue aluminum body with a brushed metal effect-finish and Rose Gold accents on edges, so from the style point of view the new AIO looks very impressive and matches design of ASUS’s premium ZenBook laptops. 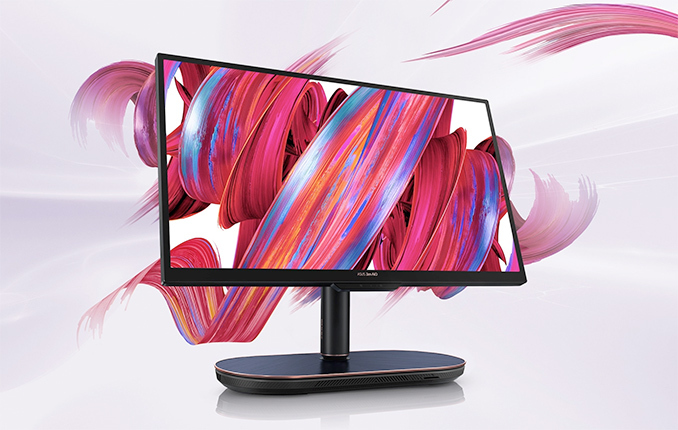 As the model number implies, the ASUS Zen AiO 27 Z272SD comes with a 27-inch multi-touch IPS display panel featuring a 4K Ultra-HD resolution, covering 100% of the sRGB color gamut, and factory calibrated to Delta E < 2 accuracy. 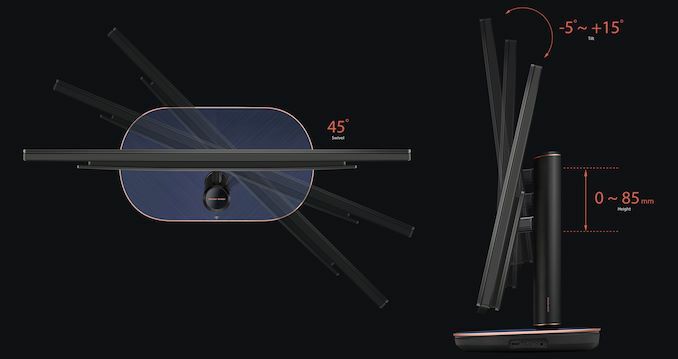 ASUS will also offer a display panel with a Full-HD resolution, though for select markets only. Because of the new system layout, the monitor can adjust its height, tilt and swivel. For some reason ASUS placed its Windows Hello-compatible 1 MP webcam with IR sensors and a microphone array below the display panel, a location found unfortunate in case of laptops. The Zen AiO 27 Z272SD is based on up to Intel’s six-core Core i7-8700T CPU paired with the B360 PCH and accompanied by NVIDIA’s GeForce GTX 1050 GPU with 4 GB GDDR5 memory, which is a significant upgrade when compared to the previous-generation Zen AiO ZN270IE system (quad-core Core i7-7700 and GeForce GTX 940MX). The new Zen AiO PC will come with 8 GB – 32 GB of DDR4-2400 memory, a 128 GB – 1 TB SSD (PCIe or SATA), and an up to 2 TB hard drive. Select configurations may also feature an Intel Optane Memory caching SSD to cut down costs while retaining SSD-like responsiveness. Next up is I/O. On the wireless side of things, the Zen AiO 27 Z272SD feature dual-band 2x2 802.11ac Wi-Fi as well as Bluetooth 5. As for physical ports, the PC is equipped with a GbE jack, three USB Type-A ports, one Thunderbolt 3 port (up to 20 Gbps), HDMI input & output (with a switch button), a TRRS audio connector, a microSD card reader and so on. In theory, the TB3 port enables owners to use external graphics and storage subsystems with their AIOs, but since ASUS had to limit bandwidth of the port to 20 Gbps aggregate, it is not guaranteed that bandwidth-hungry devices will perform as expected. Moving on to audio. ASUS and other makers of premium all-in-one PCs these days pay a special attention to sound subsystems of their products as they naturally want to provide a premium multimedia experience without requiring their customers to use external audio (which is complicated due to presence of only one audio connector). The ASUS Zen AiO 27 Z272SD is outfitted with a quad-speaker system featuring 300-cc sound chambers and co-designed with harman/kardon. Dimensions Width 62.7 cm | 24.68"
Height 52.3 cm | 20.59"
Depth 1.99 cm | 0.78"
ASUS plans to start selling premium versions of the Zen AiO 27 Z272SD this month. MSRPs for the U.S. market are unknown, but in Japan the system will cost ¥250,000 ($2,206) excluding taxes.